Louella Sexsmith, Byra G Sackett, Nina J Rhys, Alexis Dunham and Michael Ann Sackett. 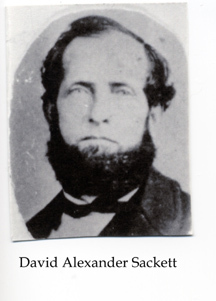 Data on David Alexander Sackett researched by Louella Sexsmith. 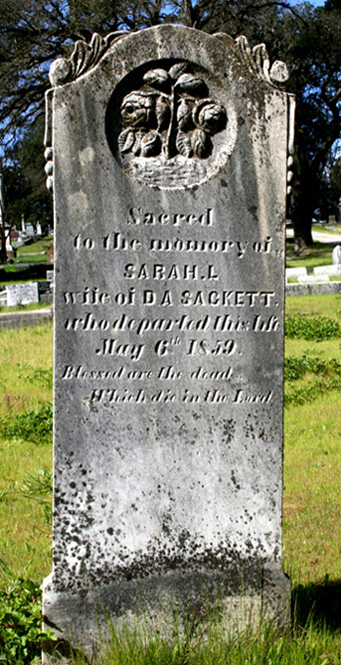 Heritage Consulting, "Millennium File", database, Ancestry.com, unsourced record, "Sarah Lawrence, b. Jun [no year given] at Bunker Hill, Kent, father John Lawrence, spouse David Alexander Sackett, child Samuel Arthur Sackett." Baptisms Register, Tudeley and Capel, Kent, database, Ancestry.com, "28 Jun 1819, Sarah Lawrence d. John Lawrence & Susan." Thurmon King's database, 4184 David Alexander Sackett.